It bugs me so much that the word “privilege” is used in this context. 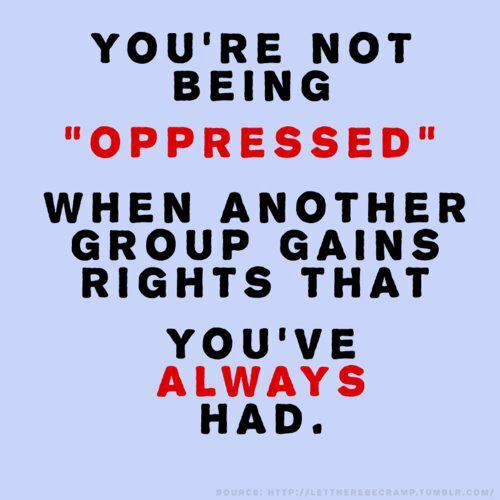 “Privilege” is something that not everyone has, and that not everyone should have. But everyone should be able to travel without fear of being stopped for no reason. Everyone should be able to live day to day without fearing for their lives if a police officer notices them. Everyone should have their accomplishments respected and accepted without questioning if they had actually earned them. Everyone should be able to go through their lives without experiencing a constant barrage of insults or “jokes” aimed at their ancestry, or gender, or sexual proclivities, or skin color. Using “privilege” to describe these benefits says that they should be taken away, which is the exact opposite of what ought to happen. These are not privileges — they are what everyone ought to have. But given the standard response when the phrase “_____ privilege” is used, this terminology fails to convey that. The response is typically, “I am ____ , and I don’t have any special privilege!” And that response is correct — they don’t have any special privileges. What they do have is the ordinary way life should be for everyone, but isn’t. So what would be better? “Respect”? “Dignity”? “Liberty”? Personally, I think discourse on this topic would be improved if the focus were less on what group X has, and more on the gap between what group X has and what other groups have. There is a phrase already in common parlance: “income inequality”. I think we need a focus on “dignity inequality”, or “liberty inequality” — the emphasis being not to take it away from people who have it, but to make sure that everyone has it. To be clear (because someone will read this far and yet still somehow fail to understand this), I am not saying that the disparity does not exist. I think you’d have to be willfully ignorant or just plain despicable to claim that (and many ignorant and/or despicable people do — Google “myth of white privilege” if you want your love of humanity severely tested). I am saying that if we, people of good will, are to come together and eliminate that disparity in treatment, describing it as a “privilege” makes that work more difficult.